Ok, well, I have had much time in Clinton, Iowa and plenty of time with the local Wiccan community. I can tell you about the above insert about seeing a man by the lock and dam 13, if you turn your back to the river and begin to climb the cliffs, you will find what is called the thousand steps. It used to be a hiking trail in Eagle Point Park but was considered too dangerous and partially demolished. Demolition stopped with the death of demolition workers. Many people venture where they shouldn't and the last death I heard of in the area was an elderly man in 2005 or 6. As for the schick general hospital, aka Cambridge, I lived there for years and that caused a series of mental disorders. I have seen and experienced too many things to put in this insert but maybe I will write you all again. I have a lot of insight on this subject so please feel free to ask questions and next time I am on I will answer what I can. 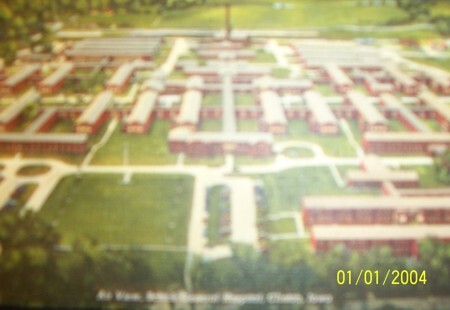 I have enclosed a picture of the hospital taken in the early 1940's. Thank you for the picture. I climbed around on the thousand stairs when I was a teenager, and they were in bad shape back then!!! Cambridge places used to be an army hospital or so I'm told, and I've known many people who lived in those apartments, and everyone has at least one scary tale to tell. Please share more. People say it's haunted but don't have a story to tell about it. I lived there before but have never really seen anything.